Italian champions Juventus have confirmed the signing of Ghana international Kwadwo Asamoah. 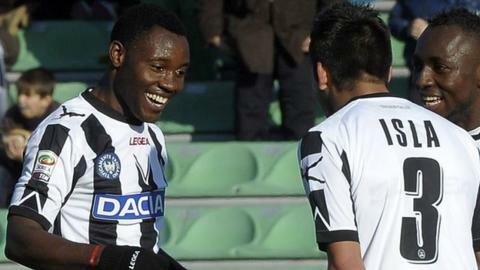 The Black Star, 23, has joined Chile's Mauricio Isla in leaving Udinese for the Turin side. He will become the second Ghanaian to play for Juventus, following on from former Ghana captain Stephen Appiah, who left the club in 2005. Asamoah has told BBC Sport that he has signed a five-year deal with the 28-time Italian champions. Both Asamoah and Isla had medicals last month but the details of the contracts were only announced on Monday. Both players have joined on co-ownership agreements, with Juve paying 9m Euros for 50 per cent of Asamoah's registration.